Recently, PartySavvy had the pleasure of working with Carnegie Mellon University to provide the event infrastructure for some of the events surrounding the inauguration of their new university President, Farnam Jahanian. In April of this year, we were contacted by representatives of the University Events department regarding the events they were planning to hold on October 25th and 26th. Because there was not a suitable indoor venue on campus, the thinking was that these events would be held in a tented structure. Due to the importance of these events, the planners wanted to do something new, and different from any of the many tented events that had been held on campus in the past. The structure needed to be large enough to accommodate up to 500 people for a formal dinner, and 1000 or more for an informal luncheon the following day. What Goes Into A Large-Scale Tented Event? Large-scale tented events such as this often require clear span structures, flooring, heating, cooling, and a multitude of other specialized services. While PartySavvy does not stock all of these things, we have relationships with companies we partner with to pull it all together for our customer. For this event, we partnered with Tents, LLC to provide the main structure, flooring, generators, power distribution, and HVAC services. In addition to being involved with the planning of the events, PartySavvy provided tenting for catering, as well as 20,000 SF of carpeting for the main structure. Due to the complexity of the project, CMU contracted with a large production company to oversee all of the events; they contracted vendors to provide specialty lighting and AV services, as well as furniture and décor. The end result was a collaborative effort of many vendors working together, along with university representatives, to produce a beautiful venue for the events, right on campus, on what is normally an open lawn area. 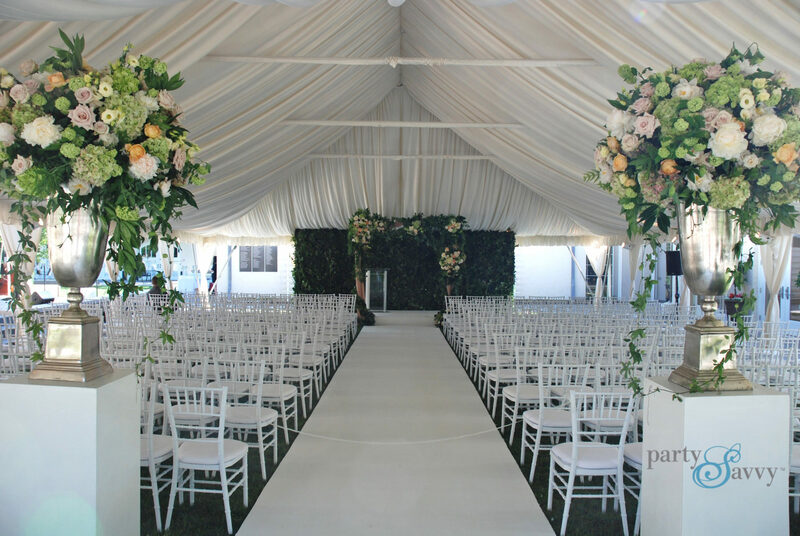 The clear span tent used for this event was a 30 meter by 60 meter (roughly 100’x200’) Arcum structure, installed on top of a level floor, which was built over a sloping lawn area. In order to accommodate the slope of the site, the floor was 7’ tall at the low end of the lawn. The unique feature of the Arcum structure is the curved roofline. 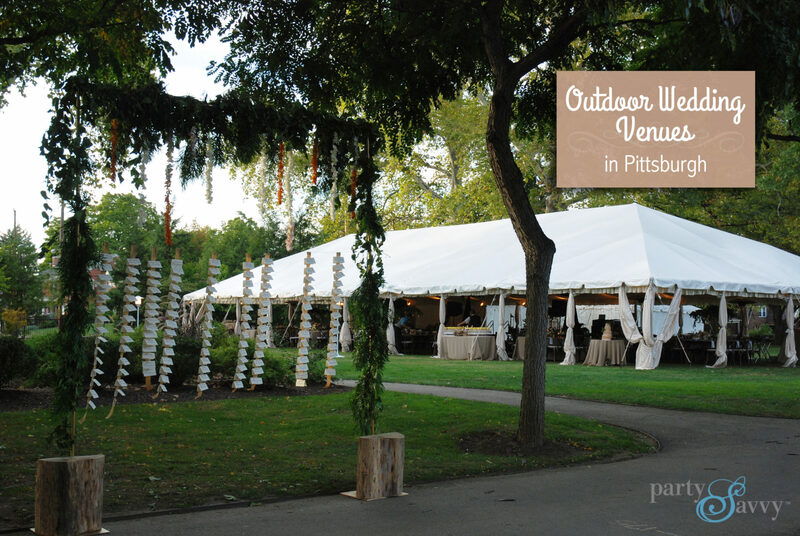 The first 1/3 of the tent, which was used for a cocktail reception, had white roof panels and white sidewalls; the remaining 2/3 of the structure, which was used for dining and entertainment, had clear roof panels, as well as clear glass walls on two of the three sides. Heavy gray draping was installed to separate the cocktail area from the dinner area. Since the floor was elevated, we were able to bring the heat in though vents in the floor of the tent, rather than through the sidewalls. The installation of this job took twelve days from start to finish; the removal was completed in five days. It took a lot of men working twelve hour days, and some heavy equipment, to complete the work on schedule. The success of events of this type and scale is dependent upon detailed planning and coordination among all parties involved, including the university events staff, the production company, and all vendors working together to produce a beautiful and memorable event. The end result was stunning! Browse through more photos in the gallery below.